If you’ve ever read any of my other pieces for Brafton.com, you know I like to talk about Beyonce, pets and online shopping. This time, I’m going to hold back. Today, we’re diving right into the topic at hand. We’re gonna streamline this baby. Streamlining your content production allows your marketing team to work more efficiently, producing better, higher-quality articles, videos and social posts. It also allows you to work faster, addressing content gaps and targeting certain topics sooner than your competitors. If you’re working with a content marketing vendor, this is when you’ll meet your external team. You’ll get to introduce any stakeholders on your side, learn the roles of your different team members and explain your business’s branding and goals. If you’re not working with a vendor, the onboarding meeting is still a great time to make sure your internal team understands your marketing strategy and objectives. What topics will you cover in your content, and what form will they take? These important decisions will influence the rest of your strategy. For example, if you plan to produce more videos than social posts, understand that you’ll have to work with longer timelines. A tweet can be created in a day, but not a video. We all know how important deadlines are to ensuring project completion. Since content moves in real time (what’s trending now may be buried in an hour), missing a deadline could compromise a piece’s performance. This is the part that feels the most like progress – at least to me. There’s nothing like taking all of the information you’ve initially compiled and getting started on your project. That said, content creation can take the longest amount of time, especially if multiple stakeholders want to review the piece before it goes live. That said, good content needs time, and you can streamline other areas of the production process to make up for the hours you spend here. This is the only step in the process that can’t be rushed. Like it or not, it takes time for your content to really show its impact. Just be patient and keep checking your analytics. While none of these steps can be skipped, they can be streamlined to make your work more effective and efficient. Quick: Create a third-grade curriculum that aligns with state education guidelines and prepares students for end-of-year exams. It’s hard, right? I bet only the elementary school teachers among us would be able to launch themselves into this task immediately. I don’t know about you, but I have no idea what third graders need to know, what they already know and what will resonate with them. Brainstorming content without guidelines is much like creating a school curriculum without knowing anything about education. It’s impossible to plan several months’ worth of content in a timely manner without any insight. So, before you get started, do as much research as possible to avoid wasting time brainstorming in the dark. Use tools like SEMrush, MarketMuse, BrightEdge or Searchmetrics to identify topics and keywords you can easily rank for. Also, use social monitoring tools like Buzzsumo, Hootsuite or Sprout to see what your audience is talking about. This will make your ideation process much faster, and you’ll end up with more relevant topics. Who is responsible for creating content? Who will review it before it goes live? Who makes the final decisions if and when disputes or uncertainty arises? Identifying these roles ahead of time helps you avoid content delays whenever questions like the above come up. It also lets everyone know who to turn to when they’re unsure of something, so they’re not sending emails to three different people trying to find the one who can answer them. If you plan on incorporating video, you’ll also want an animator or videographer. Even Google Drive is handy if you need a completely free version. Should your writers use the Oxford comma? Will your film talent look directly at the camera, or should they show off their stunning three-quarter profile? Which of your buyer personas is the piece of content targeting? It would be nice to memorize everything in our style guides and recall the names and details of every persona, but few people have the brainpower. Instead, it’s your job as a marketer to make sure your team has all the prerequisite materials they need ahead of time. This could be as easy as compiling all marketing materials in a folder in the cloud and granting access to anyone who needs it. At times, you may find your content marketing tools lacking for new topic ideas, and your creatives will struggle to come up with anything new. This is when a bank of evergreen material comes in handy. Having certain topics, outlines or drafts set aside for periods of content droughts keeps production moving swiftly until something in the industry shifts, giving you fresh ideas to create from. Now let’s hear from you! 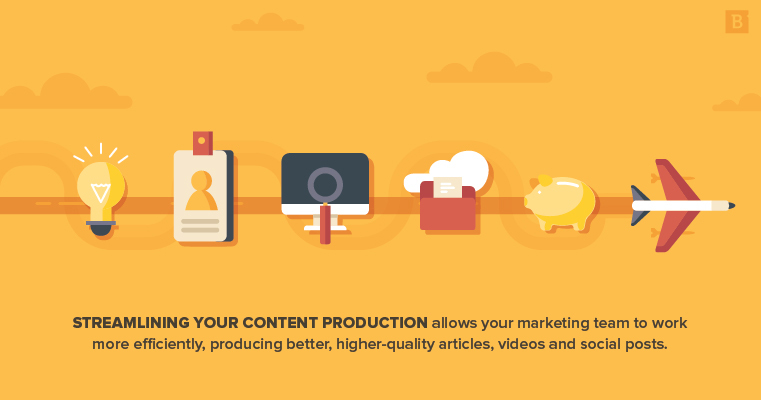 What is your content production process like, and where would you like to increase efficiency? What is a style guide and how does it support your branding efforts?